When Jurassic Park rolled into theaters, the scariest thing about it was probably the low thudding of the Tyrannosaurus rex coming for the kids, illustrated by Steven Spielberg with a cup of rippling water. The T. rex's footprint size was only about 3.3 feet long however. 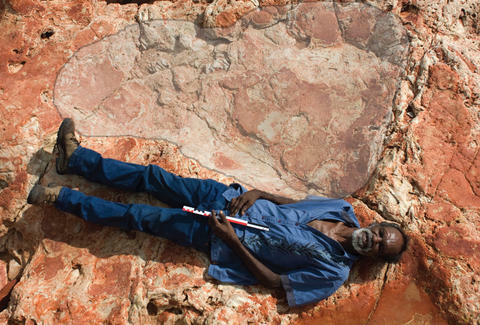 Real-life paleontologists in Australia, however, have uncovered the largest dinosaur tracks in world, measuring them to be as much as 5.6 feet long. The find comes from a discovery of 21 different types of tracks along a 16-mile chunk of the Western Australian coast. Between 2011 and 2016, researchers from the University of Queensland and James Cook University studied thousands of footprints. It's such an "unparalleled" discovery that Steve Salisbury, the lead scientist on the published study called it "Australia's Jurassic Park." "Nowhere else has as many different types of dinosaurs represented by tracks," Salisbury said in a video published by the University of Queensland. The tracks date back at least 140 million years and belonged to stegosauruses, two-legged ornithopods known for their ability to chew, and giant sauropods -- the huge long-necked dinosaurs we recognize today from The Land Before Time and the scene that nearly made Dr. Alan Grant poop his pants in Jurassic Park. They're the ones responsible for the massive tracks shown in the photo above. Though we're only just looking at them now, these dinosaur tracks are important to the Walmadany region's local Aboroginal people, the Goolarabooloo, who have sung traditional songs about them for generations. The tracks were put at risk in 2008 when the Western Australian government approved a $40 billion project to process liquid natural gas in the area, which the Goolarabooloo were able to eventually prevent in 2013 after notifying Salisbury and his team and securing a National Heritage designation for the site in 2011.